Gain On-Camera Confidence by Training Your Mind and Emotions. Listen to this conversation. You do not want to miss it. The things he covers is applicable to you too. Listen in. If you listened to Episode 29, then you know I took Ian's course and subscribed to his coaching. I made the decision to do so after this coaching session you hear in Episode 30. I knew I had to do what my word for 2019 demands - commit. So I committed to jumping into this program, Get On Camera Confidence, and I am glad I did. The 21 Day Program literally changed my life and business. I am so stoked about doing video now for our business. I am so relieved and so excited about the barriers I knocked down with Ian's help. I was so very uncomfortable when we started, but now I am at ease with the camera. I even look forward to it. I did it! I completed the program even though I was so hesitant to even begin it. And how I am so glad I did. The program is made up of several pieces. There is an on-line course that is great at teaching the concepts. There is homework involving shooting short videos each day. Also, Ian coaches daily and dials in the gaps between the videos and the concepts. The trifecta of the knowledge, the coaching and the practice is a powerful approach. It certainly carried me from a low performance start to a high performance finish. We did all of this in five to ten minutes a day. Some of the concepts and exercises seem simple or silly, however they work. You just have to do them and trust the coach. The key is to do what your directed to do, even if you become extremely uncomfortable. This is the key to making progress. If you go to Get On Camera Confidence, you can see a video of Ian interviewing me about the program. He made an impromptu call to me to interview me so my answers would not be rehearsed. You get to see me in my farm clothes as I was working on the farm that day. I stopped to speak to Ian, so the video and conversation is raw. We want you to succeed. We know that you may very well be struggling with mindset and comfort zone issues. I know because I have dealt with these too. Even if it isn't video, these concepts are powerful. Put them into practice and work on them. If Video is a concern of yours, especially as it relates to you or one of your employees being on camera, check out this program. 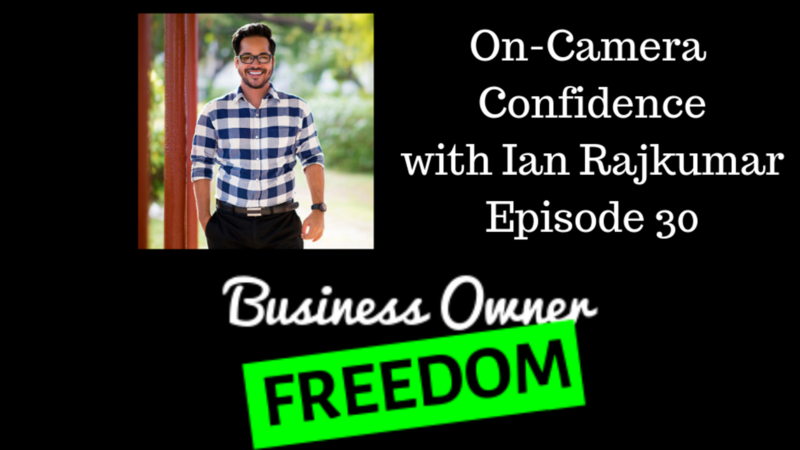 Get On Camera Confidence is a great program and it is absolutely the real deal. I can say first hand, it works.